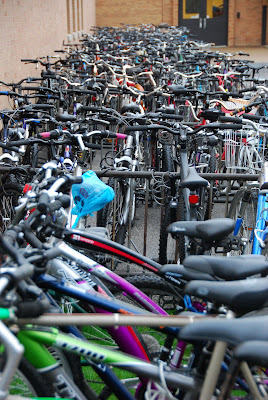 Yesterday's opening day of Bike To School Month at Bay High School saw an amazing 363 students ride their bikes to school! Today, 310 students still rode in, even with the temperatures in the low 40's and without the first-day incentive of the free Chipotle burrito! Century Cycles' owner Scott Cowan talked about the Bike To School Month event this morning on Kickin' It With Kenny. You can view the video clip on the Fox 8 Cleveland web site.